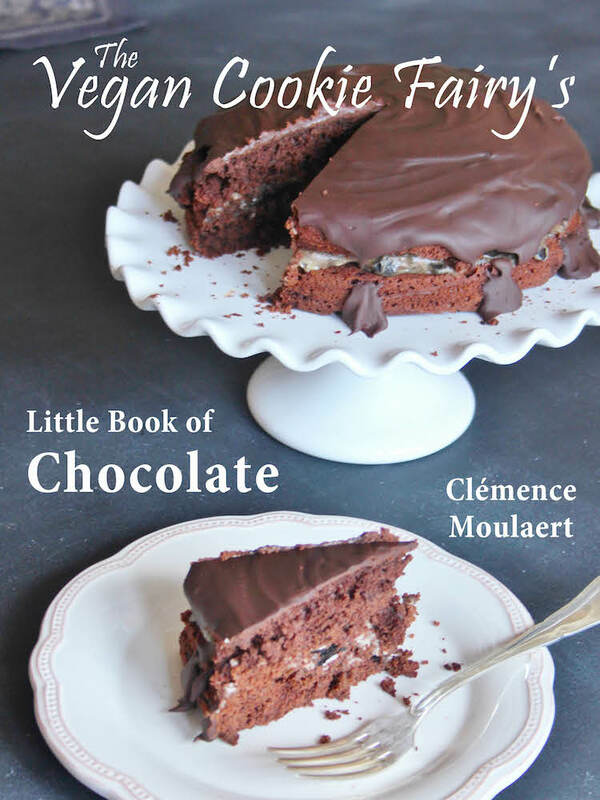 I am so very proud to share the first photographs from one of my TWO upcoming ebooks: The Vegan Cookie Fairy’s Little Book of Chocolate and The Vegan Cookie Fairy’s Christmas Recipes. Chocolat: Fondre de Plaisir contains a recipe for chocolate pecan pie – as soon as I opened the book to that page I knew I wanted to share my vegan adaptation of that recipe, as it appears in my ebook. I hope you like it as much as I do. These two ebooks are definitely a labour of love; I worked on them for months every moment of my spare time while I was studying full-time to complete my Masters degree, taking part in extracurricular activities at my University and maintain this blog. Chocolate has been a constant element in my life: when I was in need of comfort, celebration, stimulation or just a sweet snack to soothe my soul. It is my favourite ingredient by far, and that’s why I wanted to share all my chocolate recipe with you. This book is my thank you letter to you all, for sticking with me, for encouraging me, for writing to me, for helping me become a better writer, photographer and blogger. P.S. Look out for some reviews in the next week or two, you’ll be getting sneak peeks at my books! A pecan pie is in and of itself a beautifully decadent dessert, but I like to kick it up a notch every so often. Chocolate + nuts + pie = heaven. This would make a terrific addition to any Thanksgiving celebration, or simply be a wonderful treat on a cozy autumn day indoors with a good cup of tea or coffee. 1. Start with the crust: sift the flour, cocoa powder and sugar into a mixing bowl and add the vegan butter. Rub the ingredients with your fingertips until the texture becomes sandy. Roll the mixture into a ball, wrap it in cling film/food wrap film and place it in the fridge to chill for 1/2 hour. 2. Pre-heat oven to 180C/350F/gas mark 4. Grease a 28 cm (11 inch) pie dish with some vegan butter. 3. Sprinkle some flour onto your work surface. Take the chilled dough from the fridge and roll it out to about 0.5 cm (0.25 inch) thickness. 4. Drape the dough over the pie dish and gently press it onto the bottom and the sides of the dish with your fingers. Cover the dough with a piece of nonstick parchment paper and spread some baking beans on top. Bake the crust for 17 minutes and cool it afterwards on a wire rack/cooling rack. 5. To make the filling, put the tofu, cocoa powder, maple syrup, melted coconut oil, cinnamon and half of the almond milk into a high-speed blender. Blend all the ingredients until thick and creamy. If your blender is struggling to blend all the ingredients, add a little more almond milk. 6. When you’re happy with the consistency of the filling, pour it into the pie dish, spread it evenly and place the pecan halves on top. Put the pie into the fridge to chill overnight, or at least for 6 hours. Recipe and photographs courtesy of Luscious Books. Thanks! If you love pecan pie you fall head over heels in love with this one! Your food looks devine. Always. Excited for your ebooks to come out! Loved the recipe, and congratulations on your book release! 🙂 I actually found this blog when I searched for vegan cookie recipe, it was the fifth or so from the top! Glad I did cause this looks so tasty! I was tempted to Google after posting my wife’s recipe on our blog haha! Anyway great fantastic work! And hey we even use the same Adelle theme! Thanks for sharing your creations – they’re beautiful! I just officially asked for birthday pie instead of cake this year!!!! Mmhh, looks yummie, will try at the weekend. Do you use silken Tofu? I actually ALWAYS use firm, never silken. I just don’t see the point in silken tofu, I like my puddings to hold their shape. I just blend a little longer. Especially for this pie, I would definitely NOT use silken tofu because the filling needs to set really well, you don’t want it to ooze when you slice through the pie.